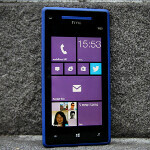 Want to use Wi-Fi calling on your T-Mobile HTC 8X? The HTC 8X is no longer available at T-Mobile, but that doesn't mean that you can't use a little trick and have the phone enabled for Wi-Fi calling over T-Mobile's pipeline. An HTC 8X owner named James discovered that he could add Wi-Fi calling to his phone. The handset is running software version 8.0.10211.204/1532.20.20010.531, and by going to the T-Mobile website, James changed the name of the phone he is using to the BlackBerry Bold and selected the free Wi-Fi calling feature. Once that was all set up, a factory reset of the HTC 8X was performed. Once the phone rebooted, the blue Wi-Fi calling tile appeared on the home screen. The service now allows him to make free phone calls over Wi-Fi, the same way that the entry-level Nokia Lumia 521 does for its owners. Let us know if this little trick worked for you. If you are an HTC 8X owner using the T-Mobile network, follow the steps above and let us know if you are now able to access Wi-Fi calling on your phone. Just means that there's no additional charge to use the service. So, it's free based on how you put it.